In an effort to curb the rate of illegal migration to neighboring nations, the interior ministry introduces new laws that enforce tougher penalties for human smugglers. The government of the self-declared republic of Somaliland will stiffen penalties for human trafficking to stem illegal migration, particularly by the region's youths. "Of course there is an article in Somaliland's penal code dealing with this issue, but we think it is not deterrent enough. 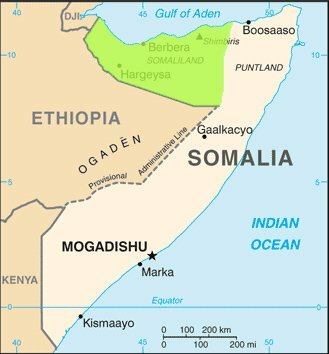 For this reason, the government plans to pass new laws to prevent human smuggling," Mohamed Osman Dube, Somaliland's administrative director in the interior ministry, told IRIN. At present, Article 457 of Somaliland's penal code identifies the selling and purchasing of humans as slaves as offences punishable by prison terms of 3 to 12 years. Article 466 further provides for a three-year prison term for those found guilty of engaging in physical abuse, according to Mustafe Mahdi, a Somaliland lawyer. The new laws are aimed at reducing irregular migration from Somaliland to Ethiopia and onwards to Sudan, Libya and Europe. When passed, they are expected to include tougher punishments for smugglers and to provide ways to rehabilitate youth migrants, added Dube. While solid figures on human trafficking in Somaliland are not available, in late June, Somaliland President Ahmed Mohamed Mohamoud (Silanyo) nominated a ministerial committee to address the problem, expressing concern over growing youth mass migration and related deaths. According to a recent survey by the community-based Somaliland Youth Ambition Development Group (SYADG), for example, at least 15 Somaliland youths died in May in the Sahara desert, between Libya and Sudan, either from being shot dead by smugglers or due to the harsh conditions. The 15 were part of a group of 325 youths, from which 31 are still missing, with 83 and 80 others in Libyan and Tunisian prisons, respectively, according to SYADG spokesperson Ahmed Jamal. Most of the youths migrating from Somaliland have been from poorer families, but those from better-off families are increasingly risking the perilous journey to Europe. "When I was looking for my son, I received a phone call from a stranger asking me to speak my son. The stranger told me to pay him US$5,000 in smuggling fees. I said, 'I will look for the money', but unfortunately, my son was shot dead," Mohamed Da'ud, the director of planning in Somaliland's interior ministry, told IRIN.